Repost (for beginners)- How to Shoot a Rifle | Firearms, Edged Weapons, Fighting Fitness and More! From some men, learning how to properly and safely fire a rifle is a skill they picked up when they were just knee high to a grasshopper. These guys probably got a .22 for their 12th birthday and spent summers in the woods plinking tin cans and squirrels and autumns hunting deer with their dads and grandpas. Me? I wasn’t one of those guys. But lately I’ve been wanting to learn how to fire a variety of firearms. I’m sure there are other men out there who, like me, went their entire life not ever shooting a rifle, but now have the desire to learn. It might be because he wants to take up hunting. Maybe he’s interested in home protection. Or perhaps he’s just interested in marksmanship as a hobby in and of itself. Whatever your reasons are for wanting to learn how to fire a rifle, you need to know how to do it safely and correctly. A few months ago we did a post on firing a handgun safely and correctly. This time we’ll focus on how to shoot a rifle. So I headed back over to the U.S. Shooting Academy here in Tulsa, OK to talk to Mike Seeklander, Director of Training at the Academy. He explained the very basics of firing a rifle and today I’ll share what I learned with you. Editor Note: Mike Seeklander no longer works at USSA and now runs his own company, Shooting-Performance LLC exclusively, and is also the co-host of the t.v. show, The Best Defense on the Outdoor channel. Just as he did when we talked about firing a handgun, the very first thing Mike brought up were four rules, that if followed strictly, will keep you and others safe so you can have a good time firing off a few rounds. 2. Always keep the firearm pointed in a safe direction, a direction where a negligent discharge would cause minimum property damage and zero physical injury. The safest direction to point a gun is always downrange (as long as there aren’t any people downrange!). Rifles are high powered firearms typically used to hit targets at long distances. Rifles are designed to be fired from the shoulder. Grooves, called rifling (hence the name rifle), are cut into the barrel of a rifle. Rifling makes the bullet spin as it leaves the muzzle, making the bullet much more accurate and stable in flight. 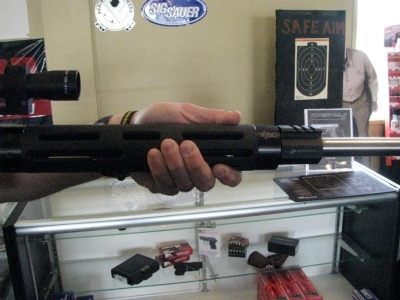 There are a variety of rifles out on the market that serve different purposes. Here’s a quick rundown of the most common. Bolt action rifles. Hunters often use a bolt action rifle like the Winchester Model 70 which requires the shooter to manually open and close the breech of the gun to eject a spent casing and load a new one. Lever-action rifles. If you’re a fan of Westerns, you probably noticed the cowboys in the films firing lever-action rifles. Lever-action rifles use a lever located around the trigger guard area to load fresh cartridges into the chamber of the barrel when the lever is worked. The most famous lever-action rifle of the Wild West was undoubtedly the Winchester rifle, a favorite firearm of badasses like Bass Reeves. Semi-automatic rifles. A semi-automatic rifle fires a single bullet each time the trigger is pulled, automatically ejects the spent cartridge, and automatically chambers a new cartridge from a magazine. Most modern semi-automatic rifles are made from lightweight synthetic materials that make them easy to hold and carry. The most popular semi-automatic rifle is the AR-15. Here in the United States, there are no federal restriction on civilians owning AR-15s, though some states, like California, do place restrictions on ownership. Other states, such as Texas, have no restrictions and even allow semi-automatic rifles for hunting. The rifle Mike used in our photos was a JP-15. 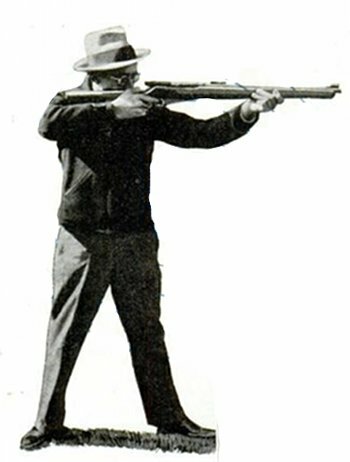 Many first-time shooters stand in a bladed-off stance when firing a rifle. They probably saw their favorite cowboys or action heroes in movies take this stance, so they assume it’s the best way to stand. Mike says that while a bladed stance is good for competition shooters who need precision in their aim, it’s not a great stance for shooters in more tactical situations that require rapid shots with minimal muzzle rise. Squared or athletic stance. Mike and the folks at the U.S. Shooting Academy teach their students to assume an athletic stance when firing a rifle. Square your shoulders up with the target. Stand with your feet shoulder-width apart on a straight line. Stagger your strong side foot about six inches behind your weak side foot. 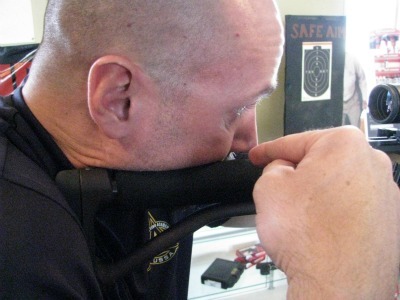 Place the buttstock of the rifle near the centerline of the body and high up on the chest. Keep your elbows down. The biggest advantage of the athletic stance over the bladed stance is that it helps in reducing the effects of recoil when firing a rifle. Think about it. If you’re a lineman in football and you want to resist the other guy pushing you backwards, what stance would give you more balance? Being squared up with the other guy or standing sideways with just one of your shoulders towards him? Squared up, of course. Another advantage the athletic stance has over the bladed stance is that the athletic stance allows you to track a moving target better. A bladed stance limits how much you can twist your body. An athletic stance allows you to swivel right or left much more easily. 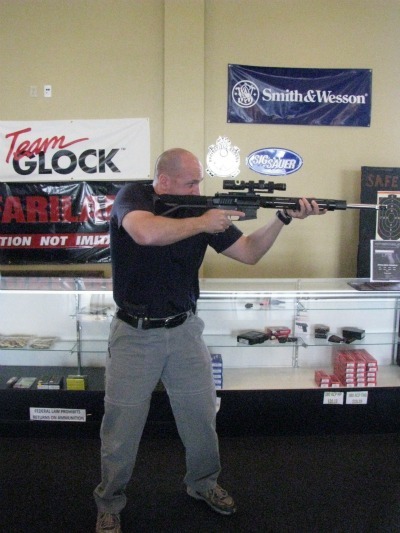 Mike recommends an athletic rifle stance for most shooting situations. 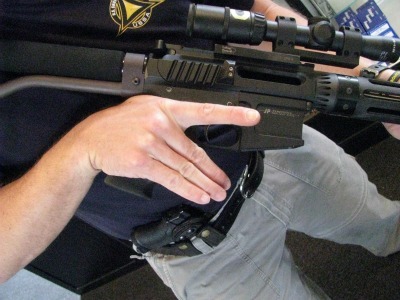 With these sorts of rifles, center the nook in the “V” at the junction of the thumb and index finger of your trigger hand. Grip the gun high on the nook. Putting your support hand further forward on the forestock will give you finer control over the muzzle when aiming, which you want when precision is key. The disadvantage of putting your support so far out on the forestock is that it’s a little less stable. Mike demonstrating proper cheek lock. You’re now ready to aim and fire your rifle. Open sights use a notch of some sort as the rear sight. They come standard with most rifles. We talked about how to aim with open sights in our post about firing a handgun. The same principles apply here. I won’t repeat what I wrote, so refer back to that post for tips on aiming a rifle with open sights. Aperture sights allow you to acquire your aim more quickly and more accurately than when using open sights. 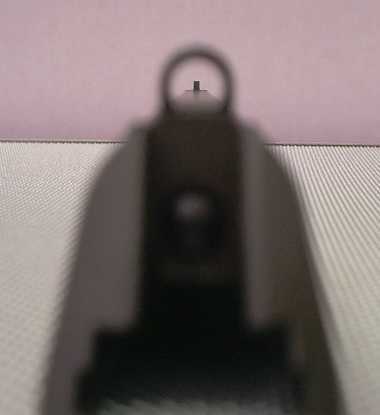 One of the problems with open sights is that it forces the eye to focus on three objects at the same time: the rear sight, the front sight, and the target. This is impossible to do, so one of the points of focus will be blurry. Aiming an open sight gun requires the shooter to know which object needs to be blurry and which objects need to be in focus. Focusing on the correct points can take precious time. Aperture sights speed-up getting a correct sight picture by removing one of the objects in the shooter’s line of sight, specifically the rear sight. Looking through the rear ring causes your eye to automatically center on the front sight at the muzzle of the gun, thus providing you with a more accurate aim, acquired more quickly compared to using an open sight. To aim with an aperture sight, simply look through the rear ring sight, attempting to only focus on the front sight and the target. The ring will blur until it is almost invisible (hence the name, ghost ring sight). The front sight should be centered in the rear ring. The greater the distance to the target, the more perfectly you need to center the front sight in the rear ring. A closer sight requires less sight precision. Aim your front sight right underneath the point you want the bullet to hit. Before firing, shift all your focus to the front sight. Well, I wish it were that easy. 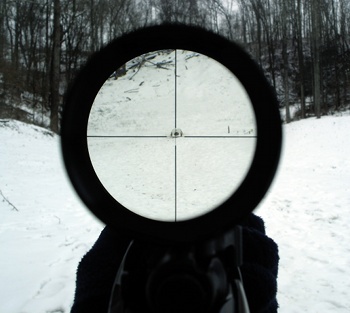 A novice shooter might notice that despite a steady hand, all their shots end up nowhere near the crosshairs of the scope. For maximum accuracy with a scope, you have to “zero” it. Zeroing a rifle is a somewhat technical process for a beginner shooter and warrants its own article explaining how to do it. I’ll do a follow-up article on how to zero a scope in the future. Have any other tips for the first time rifle shooter? Share them with us in the comments! 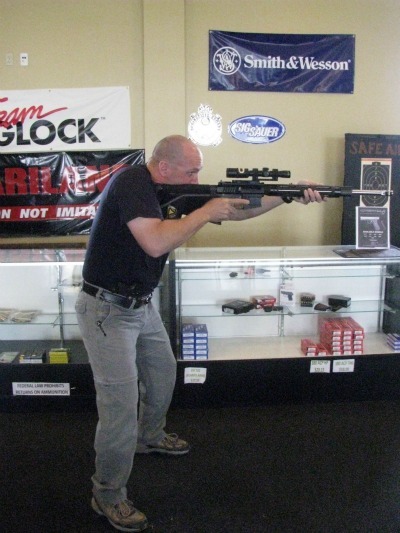 Editor’s note: This article is about how to fire a rifle safely and correctly. It is not a debate about gun rights or whether guns are stupid or awesome. Keep it on topic or be deleted. Special thanks goes out to Mike and the crew at U.S. Shooting Academy for their help on this article. Mike along with the U.S. Shooting Academy Handgun Manual were the sources for this article. If you’re ever in the Tulsa area, stop by their facility. It’s top notch and the staff and trainers are friendly, knowledgeable, and super badass. Tagged art of manliness, brett mckay, rifle, shooting. Bookmark the permalink.